If you are coming to the TCM Film Festival, I thought you might like a few historical sites to check out, especially if you are coming a day or two earlier or staying a day or two more. The DeMille Barn: This is the building that DeMille used in the making of *The Squaw Man*, one of the first films shot in Hollywood. For years the building was located just off of Vine Street near Fountain Ave. Finally, in a last ditch effort to save the historical building, it was moved to its current location across the street from the Hollywood Bowl. 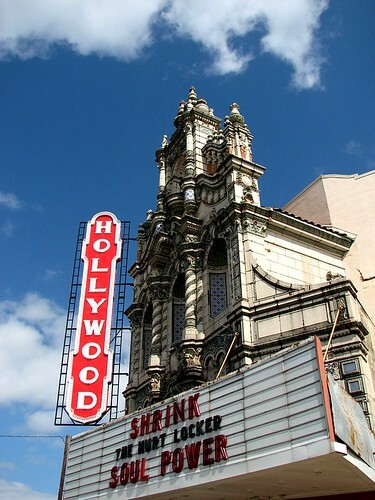 Today it is home to Hollywood Heritage, the group dedicated to preserving the historic buildings of Hollywood. There is a small but great museum inside and best of all it's affordable. You won't be disappointed. It's not that far a walk up Highland from the Hotel Roosevelt. If you are walking to the museum, be sure to take a bottle or two of water to stay hydrated. By the end of April, it will be springtime in the City of Angels. *The Hollywood Roosevelt*: Home to the first Academy Awards and built on Hollywood Blvd in the 1927, it helped anchor the west end of the Blvd. Located across the street from the famed Grauman's Chinese Theater, the Roosevelt was the classiest hotel back in the day. It's famed lounge, the Cinegrill, often featured up and coming singers who went on to have big careers as well as some of the best crooners of the day. It is said to be haunted. *Grauman's Chinese Theater*: the second of renowned theater mogul Sid Grauman's movie palaces on the Blvd. 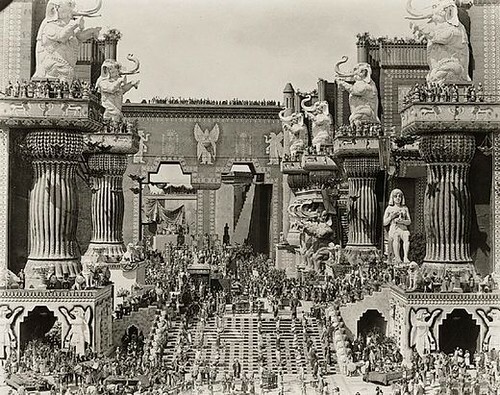 It also opened in 1927 with the premiere of CB DeMille's silent epic, *The King of Kings*. It's historic neon marquee and Chinese pagoda have graced films from the silent days to today's blockbusters. In the courtyard is the famed Footprints of the Stars. Legend has it that Mary Pickford, Norma Talmedge and Grauman's partner in the theater (and movie star and hubby of Mary Pickford), Doug Fairbanks, sr were the first three footprints enshrined. Even after Ted Mann bought Grauman's Chinese and renamed it Mann's Chinese, no one ever really called it that. It will always be Grauman's Chinese. Just west of the Chinese (where the Galaxy theaters are (or whatever they are called today) used to be the Garden Court Apartments. This wonderful beaux-arts building was home to many Hollywood stars and up and coming stars back in the day. By the 1970s, the Apartments had become run down and homeless and runaway youths were camping out in the ruins. A fire of unknown nature razed the building in the early 1980s. *The El Capitan Theater:* It originally opened in 1926 as one of the many movie palaces on the Blvd. It opened with the premiere of *Charlotte's Revue*. The Depression took a toll on the El Capitan but it was the host theater for the premiere of *Citizen Kane*. In 1942, it was renamed the Hollywood Paramount with the premiere of *Reap the Wild Wind*. It was the flagship West Coast theater for Paramount Studios until the Consent Degree took affect. As Hollywood Blvd ebbed and flowed in the post-war era, so did the El Capitan becoming by the late 1960s a seedy, second and third run theater. In the 1980s, it was bought by the Pacific Theater Chain which didn't respect the property but did appreciate the land underneath. In 1989, the Walt Disney Studios bought the theater and it underwent a restoration to return it to its former grandeur. Since then, Disney has used the theater to highlight their re-releases of animated classics as well as premiering new animation classics. Near the El Capitan is the former Masonic Temple where Jimmy Kimmel used to broadcast his show from (may still). The Masonic Temple also showcased a number of punk rock bands back in the late 1970s. Just east of the El Capitan was a drugstore that featured a minature of Hollywood Blvd circa the 1940s that graced the large show window for years until the 1980s. 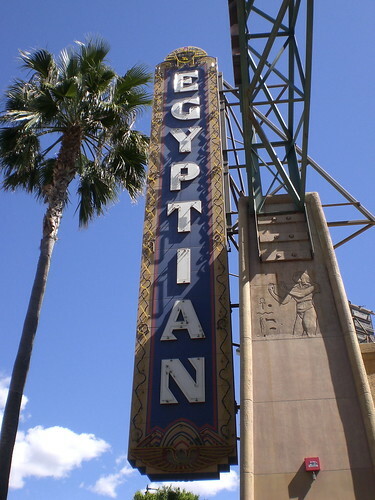 *The Egyptian Theater*: Sid Grauman's first foyer into movie palaces on Hollywood Blvd. Grauman had opened a number of movie palaces in downtown Los Angeles along Broadway St. But he had his eye on Hollywood. And the Egyptian would be the first movie palace to open on the Blvd. It cost $800,000 to build and it opened with the premiere of Alan Dwan's wonderful *Robin Hood* starring the swashbuckling idol of the day, Doug Fairbanks, Sr. The Egyptian style was part of the craze sweeping the world during the 1920s with the British expeditions of historic Egypt and the discovery of not only King Tut's tomb (two weeks after the opening of the theater) but other historic milestones as well. It's giant courtyard made it a natural for red carpet entrances. But as with the Chinese and the El Capitan, as the Boulevard's fortunes ebbed and flowed, so did the theaters. It hosted the roadshow version of *My Fair Lady* and the front of the courtyard was redesigned to include a large mid-century modern pylon sign. In the late1970s, during the multi-plex craze, the Egyptian opened two smaller theaters located on the east side of the property. Unlike the Warners Hollywood (coming up) theater, the main theater was not cut up to accommodate these theaters. In the 1980s, *The Adventures of Buckaroo Banzai* and other movies premiered at the Egyptian. The theater was badly damaged in the 1994 Northridge Earthquake that hit Hollywood hard (I was living east of the theater on Gower St just above Franklin at the time). The theater was red tagged and for along time preservationists thought the theater would be destroyed. Instead, the American Cinematheque (long the dream of the two Garys behind Filmex), bought the building from the city of Los Angeles in 1996 for a dollar. The city's one proviso was that the theater be returned to its grandeur as a movie palace. The Cinematheque undertook a large fund raising effort. The main theater had been badly damaged in the earthquake and in the restoration it was reconfigured to fit a smaller theater in the complex as well. Be aware, the Cinematheque is a non-profit that is still trying to raise money to help repair the fixes they made to the building when they took over ownership. Don't be surprised by some the crumbling facade. The Cinematheque offers one of the most imaginative film programming in Hollywood. 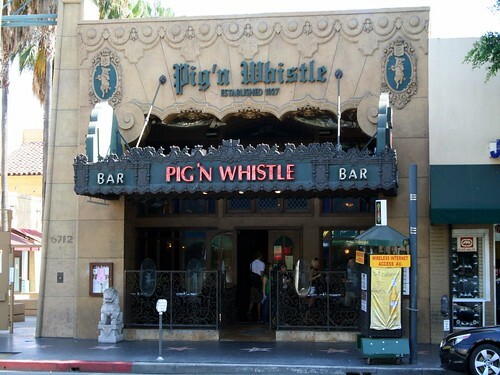 Next door to the Egyptian on the west side of the building is the famed Pig and Whistle Restaurant and Bar. Edited by: lzcutter to add pics! lz, I know you have many, many more sights to list, but I would be mad to not mention (and I hope you don't mind if I do) the Hollywood & Highland Center right across the street from the El Capitan. This is the home of the Kodak Theatre where the Academy Awards are held each year and Mann's Theaters, next door to Grauman's Chinese (the latter two where many films of the festival will be playing). 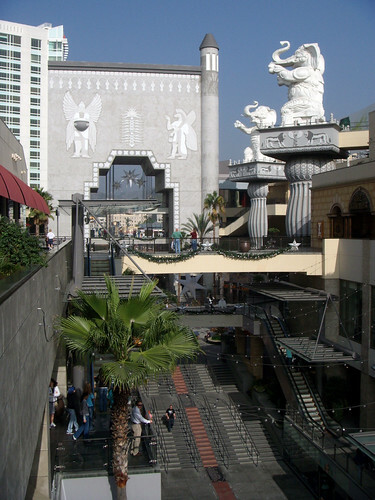 *Also the shopping complex has a reproduction of the elephant statues and arch from D.W. Griffith's Intolerance*. It is also a few feet from the Renaissance Hotel. The DeMille Barn (The Hollywood Heritage Museum) also has a great bookstore chock full of Hollywood items. It is a great place! Thanks for bringing up Hollywood and Highland. I remember when there was a highrise mid-century modern building on the corner where the Mall sits today. All that connected that end of the Blvd was the Walk of Fame. I think there was an underground garage there back in the day. And next to Grauman's on the west side of the building was C.C. Brown's Ice Cream Shoppe. Legend has it that the hot fudge sundae was invented there. They would serve scoops of vanilla ice cream in pewter cups with a side of hot fudge sauce. In the '70 and 80's,. you could buy the hot fudge sauce by the jar. It was delicious. It was decorated like you would imagine an old fashioned ice cream parlor to be with a front window that looked right out on the Blvd for all the people watching that was amazing back then. Pictures of stars hung on the wall if I recall correctly and legend had it that everyone from Clark Gable to Lana Turner came in for hot fudge sundaes during premieres. I was very sad when it closed as it was one of the last bastions of old Hollywood (like the drug store across the street) that had survived all the upheaval but couldn't survive the changing times. I'm gathering more info about the historic sites of Hollywood. I'll be adding to this thread early next week! I just got a copy of the book *Hollywood: The Movie Lover's Guide The Ultimate Insider Tour of Movie L.A.* by Richard Alleman. Looks like a great book to take with me and read as I walk around Hollywood. The rest of his site is great too. And ... well, I hate to sound like the resident Alcoholic but ... Let's not forget Musso & Frank's (Charlie & Rudy & Hemingway) or the Pig & Whistle or, last but certainly not least, Miceli's! All within the same two block radius and all of which should CERTAINLY be hit up at some point during the festival ... a rousing toast to the good old days! I quit drinking ages ago and I am actually, haha, going to start drinking again a bit for the fest cuz I wanna slug a couple back at the bar of Musso and Frank's! To Orson? To Orson! Mr. Jenkins? THAT is something that I will most CERTAINLY drink to! Although I am not above drinking at a bar alone (if it was good enough for Orson it's good enough for ME), it'd be lovely for you to join me. Seeya at the fest! So I am going to do my best during the week to eat like a REAL AMERICAN. I'm staying not far from the Bob's Big Boy in Burbank, so I'll be hitting that up. Directly across from the Big Boy is a still functioning hot dog stand that was featured in the original Invasion of the Body Snatchers. I would like to make a jaunt at some point to Pink's Hot Dog Stand on La Brea. I get in on Weds and intend on being a tourist in the Broadway Theater & Commercial District snapping pix of the the theater facades - and then eating pie at Clifton's Cafeteria. I will later in the week be staying at a friend's around the corner from Canter's where I imagine I will have a huge corn beef sandwich. And then maybe at the end of a long day of screenings I will try the burgers at the 24hr place in the Roosevelt. I don't know if my skinny Canadian body can handle a walk up to the In and Out Burger on Sunset on top of all that. Here's hoping the TCM festival has a defibrillator on site. Invaluable, thank you. Can't hit up all of this on this trip, but will try and soak up as much as possible. The Sunset Tower looks amazing. Located on Highland just south of Hollywood Blvd. Designed by famed architect, S. Charles Lee (who designed many of the famed movie palaces around the Southwest), this Moderne jewel of a building hosts the make-up salon of one of the most important men in cosmetic history, Max Factor. In the mid 1980s, the building housed the wonderful Max Factor Museum with many of the artifacts from the salon on display. Unfortunately, the building?s owners, Proctor and Gamble (who you would have thought would have known better), sold the building and the collection to a developer. Luckily, plans for demolition hit a snag when preservationist groups such as Hollywood Heritage, the Art Deco Society and the LA Conservancy began a campaign to save the building. Instead of demolition, the building became the home of the Hollywood Museum (this is the Museum?s third location in recent years). Previously located further north on the Blvd in the old Christian Science Monitor Bldg and briefly at the Galaxy Theater complex, the Museum has adapted well to the Factor Building. They have even kept some of the artifacts on display including the salons, make-up props and costumes. Don?t be turned off by the more modern look of the Museum?s website, it is worth the opportunity to go inside just to see the interior of the Factor Building. Now shuttered, this is one of the oldest theaters on the Blvd. It originally saw life as a Nickelodeon that dates back to the early 1910s. In the 1930s, it was equipped for sound and the beautiful neon marquee was added. According to my buddy Alan Hess, it was one of the first theaters in Los Angeles to be designed with side panels that would capture the eye of passing motorists, not pedestrians. Edited by: lzcutter for photos! Featured in *TCM Hideaways* with Ben Mankiewicz and Tom Brown. The oldest eatery on the Blvd. Opened in 1919, it wasn?t long before the Hollywood crowd discovered its good food and its good alcohol. It was originally named for owners Joseph Musso and Frank Toulet. The eatery was remodeled in 1937 and hasn?t changed much since then. The beamed ceilings, red leather banquettes, wooden booths with coat racks and a wait and bar staff who look they have been there for years are just some of the reasons to check it out. Our favorite reason, the bartender who looks and talks like ?Cuddles? Sakall. Paid parking is available behind the eatery. One of the things we often forget is that Hollywood Blvd, back in the early days of the 20th Century, was primarily a residential street. While almost all vestiges of that era are long gone, this house which is still located on the Blvd, is a visual reminder of a past long since vanished. The house was built in 1903 in the Queen Anne/Dutch revival style and the street was then called Prospect Avenue. 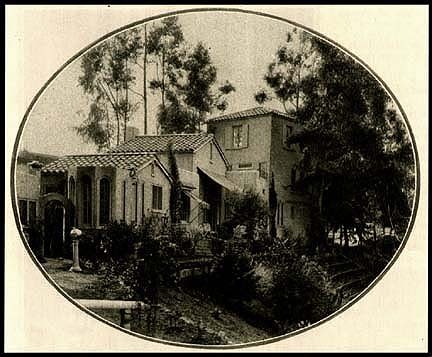 The home was built for the Janes family that included three sisters who ran a school on the property from 1911-1926, ?The Misses Janes School of Hollywood? The sisters were said to have taught the children of everyone from CB DeMille to Carl Laemmle. The house was occupied until the early 1980s when the last remaining Janes sister was moved to an assisted-living facility. Saved from demolition by Hollywood Heritage, it stands today in the courtyard of a small office and shopping complex. The big rumor surrounding the Janes sisters is that the author, Henry Farrell, got the idea for his book, ?Whatever Happened to Baby Jane? from the story of the Janes sisters. Farrell denied the rumor for years. Opened in 1927 with the premiere of *Glorious Betty* starring Conrad Nagle and Dolores Costello (who lived not far from the theater back then). It was originally a Warners Brothers theater and it was, until recently, the largest theater ever built in Hollywood seating 2,700. Originally equipped with Vitaphone equipment to showcase the Warners commitment to that brand. Atop the building is a radio transmitter. Back in the day, the Brothers Warner owned the nearby radio station, KFWB and had the tower placed on the roof of the theater where it displayed the Warner name. The architect was G. Albert Lansburgh and the exterior design was Beaux Arts. The interior was opulent Moorish styling with a giant chandelier hanging in the lobby. Also in the lobby is a plaque to brother Sam Warner who was instrumental in moving the brothers into sound films and who died just before the opening of the *The Jazz Singer* which brought the brothers back from the brink of financial problems. This is the theater where Carol Burnett worked as a teenager. She and her grandmother lived nearby at the Mayfair Apartments on Wilcox Avenue. At her request, her star on the Hollywood Walk of Fame is in front of the theater. In the early 1950s the theater was renovated and reopened as Warners Cinerama. Seating was reduced to 1500. The experiment in Cinerama lasted a little over a year and a half. In 1961, the theater was renovated again to accommodate showing 70mm films in addition to 35mm. *2001* played there for 37 weeks. In 1968, the theater was sold to the Pacific Theater chain. In the late 1970s, the theater was cut up to accommodate the addition of two smaller theaters upstairs. Despite the desecration, much of the interior still remains intact. The theater was closed in 1994 due to structural damage caused by the devastating Northridge earthquake. 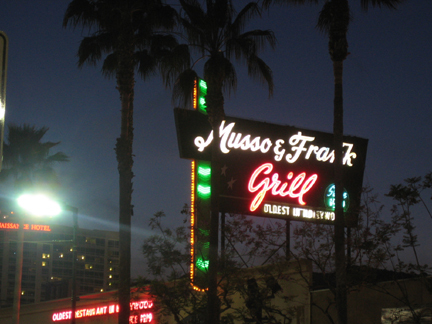 The theater, like the Janes House and Musso and Franks is a Historic- Cultural landmark. In the early 2000s, the Los Angeles Film School took over the theater and added digital projection. They also cleaned up the theater and restored the main theater to its 1960s size. Perhaps one of the most famous intersections in American culture. Back in the 1930s, many of the radio stations such as NBC and CBS, were located on Vine Street. There was a Brown Derby restaurant also located on Vine just south of the Blvd. Today all of that is gone and only CBS Columbia Square remains to remind us of another era. Hollywood and Vine has always sounded much more glamorous than it really was. The multi-floor Broadway department store was located on the south side of the Blvd near Vine. In recent years, it's roof-top neon sign has been relighted thanks to the generous support of the man who lives in Gary Cooper's wonderful mid-century modern house in Holmby Hills. Playing the Palace, Judy did, Bing did, Frank did, most every popular singer of the classic Hollywood era performed here at the Palace. It?s got a Spanish-Baroque exterior and beautiful Art Deco lobby. The Palace opened in 1927 as the Hollywood Playhouse. During the Depression, it was home to the WPA, who staged plays for all. In the 1940s, CBS broadcast various radio shows from the Palace, including Fanny Brice?s *Baby Snooks*. In 1942, it was rechristened the El Capitan (not to be confused with the movie theater) and was home to Ken Murray?s Blackout Revues. When the El Capitan closed seven years later, Ken Murray?s production was the longest running show, having played 3844 performances. The Palace was renovated for television and Bob Hope?s Chesterfield Specials, The Jerry Lewis Show and everybody?s favorite, This is Your Life all originated from the Palace. In 1964, it acquired a new name, the Hollywood Palace and ABC began broadcasting a weekly tv variety show from the place. Hosted by Bing Crosby, the show offered some of the finest entertainment of the day. Raquel Welch was one of the card-carrying young showgirls promoting ?Hollywood Palace? for station breaks. Merv Griffin took over the studios when the *Palace* series ended but by the mid-1970s, there was talk of demolition. Luckily, two young entrepreneurs came forward and invested almost $10 million in restoration monies. Rock acts performed, the Palace was featured in *Against All Odds* , two restaurants were added and a recording studio. ?The House that Frank Built? 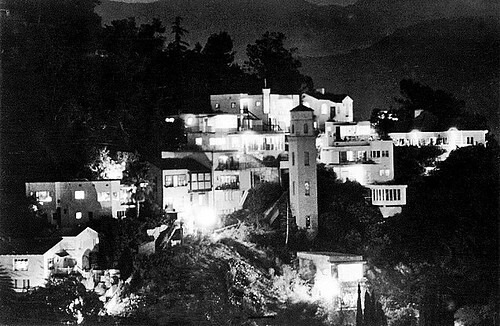 was designed by famed City of Angels architect Welton Becket. The building is 13 stories tall and stands 150 feet tall. Used to landmark Hollywood and Los Angeles in countless movies and television shows. When it was built, due to earthquake codes, it was the tallest building in Los Angeles for 1955. There are recording studios throughout the building as well as below ground. Recently the controversy has been with a nearby condo project going in and whether or not the underground construction of a parking lot will disturb the nearby recording studios. Other Welton Becket buildings include the Music Center, the lost and cherished Pan-Pacific Auditorium, the Cinerama Dome, the Santa Monica Civic Auditorium (home to the Oscars in *The Oscar*), the Beverly Hilton Hotel and many others. Nancy Olson's ( *Sunset Blvd* ) husband, Alan Livingston was the head of Capitol Records for most of its heyday. Formerly the Huntington Hartford, this theater has quite the past. It opened in 1927 as the Vine Street Theater. By the 1930s, this part of Vine Street was part of Radio Row West and CBS took over operations and it became the CBS Playhouse Theater. The famed *Lux Radio Theater* was broadcast from here. The show was hosted by a well-known director that most Americans felt they knew personally, C.B. DeMille. Many of the broadcasts were radio versions of well-known movies of that era. In 1945, following a well publicized dispute with AFRA, the radio performers union, DeMille stepped down as host. In 1954, the theater was renamed the Huntington Hartford, after the millionaire heir who bankrolled the renovation, and featured well known plays. Helen Hays opened the theater in What Every Woman Knows. Until the 1990s, the theater continued to bring plays and the occasional silent film with an orchestra accompanyment, to its subscribers and the public. Following the Northridge earthquake, it sustained some damage and was closed. In 1999, the Nosotros Foundation headed by Ricardo Montalban, bought the theater, which was then called the Dolittle. When it opened in 2004, it was renamed the Ricardo Montalban Theater to honor the man who helped change the way Latinos are portrayed on film and was the driving force behind the Nosotros Foundation. For all you TCM fans, Robert Osborne's star on the Hollywood Walk of Fame is located in front of the theater. Across the street, now long gone due to a fire of suspicious nature, was the famed Brown Derby Hollywood. Home to Joe Gillis at the beginning of *Sunset Blvd.*. Not much to look at on the inside perhaps, but its California-Spanish exterior has been part of the Hollywood landscape since the early 1950s. The neon sign can be seen from the Blvd. Famed author Nathaniel West, lived in this building known for its odd mix of architectural styles. In 1935 he moved in and began writing his masterpiece, The Day of the Locust while drinking at Musso and Frank?s, hanging out with other Blvd. denizens and picking up ideas for his story. The book, perhaps surprisingly, was not a commercial success on its initial release in 1939. West and his wife, Eileen McKenney, were killed a year later in a car crash. Her sister had written the story, My Sister Eileen and her death was mourned more than his. It would take another ten years before West would finally get his kudos from the literary world. A film was made in the 1970s on his most famous book. The 11-story HKHotel opened in 1925 and became very popular with the Hollywood crowd. Today, it is perhaps more known for its more macabre history. In 1936, Harry Houdini?s widow hosted a well-known s?ance on the roof. Hoping to reach her husband in the great beyond, the story attracted a great deal of press. In 1943, it was where police broke into the room of starlet Frances Farmer. Claiming she had failed to report to her parole officer, the police dragged Farmer through the lobby while she spewed obscenities every step of the way. In July 1948, D.W. Griffith, the pioneering silent film director who had done so much to help create American film story telling techniques, died alone in the hotel. He hadn?t directed a film since 1931 and was mostly ignored by the industry he had helped to create. His funeral, however, brought out over 500 industry movers and shakers and celebrities. In 1962, famed MGM costume designer, Irene, checked into the hotel. She tried to cut her wrists and when that failed, she leapt to her death from the roof. Two days earlier, she had displayed her latest collection at a fashion show in Beverly Hills. Newspaper accounts attribute her depression to the recent death of her husband and business problems. With its colorful neon sign out front, this long-time Hollywood bar has held its own over the changing landscape of the Blvd. It makes a cameo appearance in the wonderful *LA Confidential* where Jack Vincennes (Kevin Spacey)stops for a drink before a fateful call with destiny. The splendid Art Deco theater opened in 1930 with the premiere of *The Floradora Girl* starring Marion Davies. The real star though is the theater itself which has been home to the Academy Award ceremonies for many years as well as many red carpet premieres. The large auditorium, the lounge, the lobby, the restrooms (hint: always, always, always check out the restrooms of movie palaces, you won?t be disappointed), the tiled water fountains and the exit signs. All are a reminder of a time when comfort was more important than the bottom line. The Pantages was bought by Howard Hughes in 1949 and became a RKO theater. For ten years, it was host to the Academy Awards (1949-1959). Pacific Theaters bought it in 1967. Ten years later they partnered with the Nederlander organization and the theater became home to roadshow versions of well known Broadway plays and musicals. In the 1990s, it was open to performing artists who liked playing in smaller venues. Since the early 2000s, it has returned to showcasing Broadway touring companies. The roof-top neon sign is a recent addition. However, it has been restored and is still a remarkably beautiful theater. LoL, the Frolic Room, yes! _Total_ dive bar, but it's a must just because of the history. There's a blog I absolutely adore called [Dear Old Hollywood|http://dearoldhollywood.blogspot.com/] you really gotta check out. The guy who runs it is simply incredible, and he re-visists old movie filming locations, movie stars homes, watering holes-- you name it, it's there. Portrayed in films and animation almost since the beginning of film history in Los Angeles, this famous amphitheater has been part of the Hollywood landscape since 1919. Back then, Mrs. Christine Witherill Stevenson, heiress to the Pittsburgh Paint fortune, decided that Hollywood needed some cultural. She formed a group that purchased the Daisy Dell. Their idea was to put on religious plays. Unfortunately, squabbling among group members soon broke out and that idea fell by the wayside. With new partners, Mrs. Stevenson set out to build a place for public concerts and Easter Sunday sunrise services. The dramatic clamshell concrete band shell was built in 1929. Lloyd Wright, the son of famed architect Frank Lloyd Wright, designed two previous structures. The Bowl has appeared in films that range from the original *A Star is Born* to Looney Tunes and more. In the late 1990s, the Bowl underwent restoration and renovation of its famed band shell that still has groups up in arms over the changes to the shell that were made. A museum was added and is open to the public. John Ford, at one time, had a house that is now where one of the Bowl?s parking lots is located. The Heights was developed by an early 20th century entrepaneur, H. J. Whitley. He sent his chief architect to Italy to study landscaping and hillside construction. The architect gave Whitley his money?s worth. Be aware that the streets are very narrow and very windy. Above Whitley Terrace is the home of Richard Barthelmess fronted by pineapple shaped finials. The Barbara La Marr house is near where Whitley Terrace and Grace Avenue meet. Nearby, the odd shaped house with the round tower belonged to Joseph Schildkraut. Other owners included James Hilton, Rosalind Russell and Beulah Bondi. Further up Whitley Terrace is very steep Whitley Avenue which often doubles for streets in San Francisco. Just past the intersection is the former home of Jean Harlow with its fortress like garage. Bushman?s house, called ?Topside? was located at the highest point of the hill. ?Topside? was torn down in the late 1970s by a developer who planned to put up condos. That spurred the community into action and they sought to get the district historic status and ultimately they succeeded. Have you often found yourself watching the Robert Altman/Elliot Gould version of *The Long Goodbye* just to see that weird elevator Gould uses to get to his apartment? Well, it?s a real City of Angels landmark. Built in the 1920s as part of the Hollywood Heights development. The tower conceals the elevator that allows those who live in nearby houses on top of the hill to get down below. 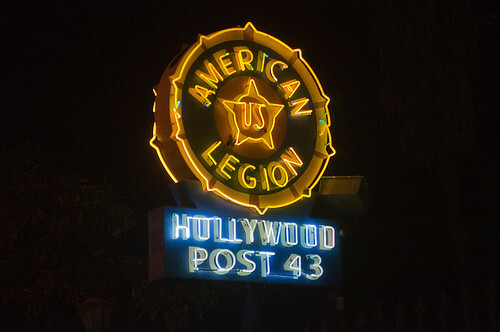 Ronald Reagan and Gene Autry were just two of the members of this American Legion post. Built in 1929 by architect Eugene Weston, Jr., the Italian fa?ade made a perfect fit with nearby Whitley Heights. In the 1980s and 1990s, it hosted a play set in an Italian villa before WWII. It was the perfect location. You are great!!! Thanks for all this info. I'm going to the Hollywood Bowl on Tuesday night to see the Eagles. I'm not a huge fan, but, the Eagles at the Hollywood Bowl on a beautiful spring night. Well, that just sounded to me like a true Southern California experience. Departures every 15 minutes until showtime, PARKING CHARGE in addition to bus. SPECIAL OFFER: If you eat at the Grill, Koji's, Trastevere, or Vert at the Hollywood & Highland Center before the show, you will get a free shuttle ride! Just tell the waiter you are going to the Hollywood Bowl show and you will get a free shuttle ticket. Shuttle tickets at Hollywood & Highland are available only on site, no advance purchase.